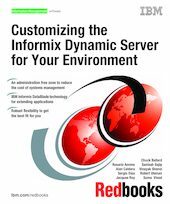 In this IBM® Redbooks® publication, we provide an overview of some of the capabilities of version 11 of the IBM Informix® Dynamic Server (IDS), referred to as IDS 11, that enable it to be easily customized for your particular environment. Although many capabilities are available, the focus of this book is on the areas of ease of administration and application development. We describe and demonstrate these capabilities with examples to show how it can be done and provide a model as you begin your customization. IDS 11 provides nearly hands-free administration to businesses of all sizes. It also offers significant advantages in availability, manageability, security, and performance. Built on the IBM Informix Dynamic Scalable Architecture (DSA), these capabilities can result in a lower total cost of ownership. For example, many of the typical database administrator operations are self-managed by the IDS database. IDS customers report that they are using one-third or less of the staff typically needed to manage other database products. Shortened development cycles are also realized due to rapid deployment capabilities and the choice of application development environments and languages. There are also flexible choices for business continuity with replication and continuous availability. By taking advantage of these functions and features of IDS 11, you can customize your IDS implementation to enable you to better satisfy your particular business requirements.